Arriving at Aqua we are pleased to find public parking behind the restaurant, after 5pm midweek it is free as well which is great for their customers. We walk in through the back entrance and pass the open kitchen, immediately hit with the wonderful smells and great atmosphere, the staff welcome us and show us to our table. The restaurant is large but very inviting, the tables are laid out well that it does not feel over crowded. 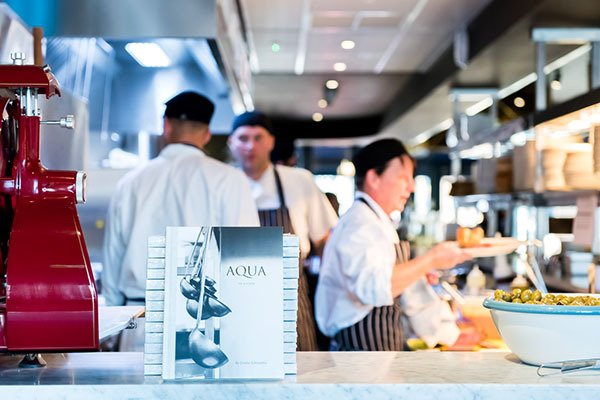 For such a new restaurant they are already very busy; there is a real buzz in Lewes for Aqua I feel. Our waiter for the evening is great, very friendly and gives us some great recommendations. For drinks it is an easy choice, as I am in an Italian and they have pints of Peroni on tap. Lucy on the other hand orders a glass of the Vidal Sauvignon Blanc, a fruity mix with notes of lemon and lime. Lucy says it is amazing though she is taking small sips to savour this as she can only have one small glass on driving duty! The menu is amazing and there are so many wonderful dishes. From the Rabbit Ragout to the Slow Roast Duck Pappardelle, the decision is very difficult. Before we choose our starters, we order an oyster each to try with their red wine and shallot vinegar dressing. We then order the Fritto Misto as this is one of Lucy’s favourites and, on our waiter’s recommendation, we order the Aqua homemade meatballs. The oysters are served on crushed ice which is a great touch. The acidic vinegar dressing is a delicious addition which does not overpower in any way; add a hint of Tabasco and these oysters are just plain delightful. The Fritto Misto is crispy but lightly battered so you can really taste the freshness of the fish. Delicately served on the plate and very pleasing to the eye, the seafood rests on the very tasty Aqua mayonnaise, making this a must for any new customer heading in to Lewes. The meatballs are served with a hearty piece of fresh focaccia for mopping up the delicious, spicy pomodoro sauce. The meatballs are cooked perfectly and hold their shape, the seasoning in the meat and the sauce is spot on. I only wish I had a large bowl, although this would leave me with no room for the main and based on the starters this will be superb! The waiter politely checks if everything is OK in such a way that is not overbearing and watching around the restaurant everyone is getting the same treatment. I can honestly say this is some of the best service I have had in years, I am very impressed. I am very excited about our mains; I have ordered the Pig Cheeks and Lucy has gone for the Pollo Farcito. The pig cheeks are served on a bed of creamy mash with a black pudding fritter and rich chianti jus. The cheeks have been braised for 8 hours and just fall apart, they are a perfect match for the rich punch of the chianti sauce that brings together the dish. The mash is so smooth and velvety, with the crunch of the black pudding fritter you have a wonderful combination of textures to go with the mouth watering taste. Lucy’s Pollo Farcito is a real triumph as well. The Italian crumbed chicken is stuffed with mozzarella and pesto, served with crispy onions and a herbed spaghetti. The chicken coating is golden brown with a great crunch and sits atop the spaghetti. Once the chicken is cut open, the filling oozes amongst the al dente pasta, cooked the classic Italian way with a slight bite. Lucy lets me try a bite and the chicken is tender and the filling moreish, just another reason for us to return. The food has been amazing and though we are both very full we decide to take a little peak at the dessert menu. The menu offers an intriguing selection from the tiramisu to a raspberry crème brulee. A great idea which Aqua offer is a mini dessert and coffee for only a fiver, perfect if you are rather full be still have a sweet tooth. I order a black americano and a mini Fig, Honey and Almond Tart, Lucy goes for my favourite of a Lemon Posset and an americano with warmed milk. The tart is warming, sweet and great with the rich dark coffee, perfect to finish a wonderful evening and not too heavy. The lemon possett is served with a crumbly shortbread biscuit, great for dipping in the creamy dessert, topped with berries and served in a little cup it is a tasty little treat to send us home with smiles from ear to ear. From the staff to the dishes laid in front of us, this was a perfect evening and Lewes is now on the map for me. I will definitely be back! 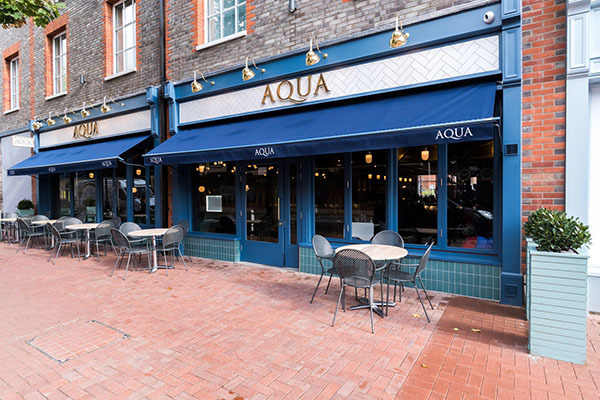 Considering they have not long been open, Aqua seem to have a big following and I would suggest getting a table booked soon.